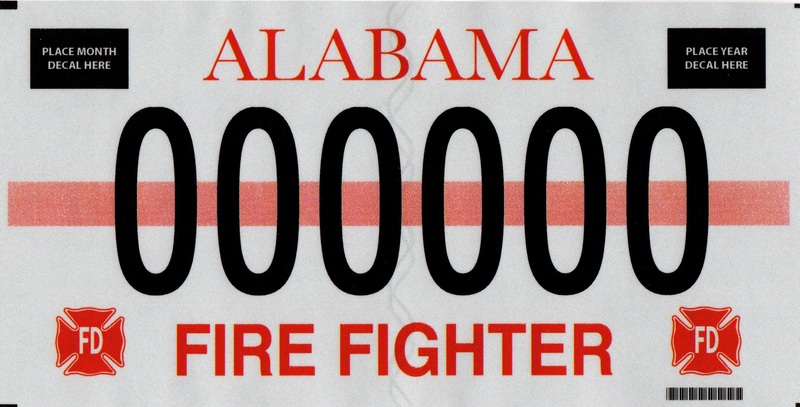 VFD License Tag List: Under Alabama Code 32-6-270 , a fire fighter who is resident of Alabama is authorized to obtain a “Firefighter” license plate for their personal vehicle. A volunteer fire fighter who is a resident of Alabama is also entitled to a registration fee exemption for one vehicle. The exemption extends only for the purchase of a Fire Fighter distinctive license plate. The Alabama Forestry Commission is directed to maintain a list of volunteer fire department members who are eligible for “Firefighter” license plates for their personal vehicles, and make this list available to all vehicle-licensing agencies throughout Alabama as mandated by state law. The volunteer's name must appear on this list in order to be eligible to receive the Fire Fighter license plate. For further information, go to the Alabama Department of Revenue website. Click on the next to a VFD to show its Tag list.